Quotations by Liddell Hart, B. H.
The most dangerous error is failure to recognize our own tendency to error. More quotes by Liddell Hart, B. H.
International relations are governed by interests, and not by moral principles. Keep strong, if possible. In any case, keep cool. Have unlimited patience. Never corner an opponent, and always assist him to save face. Put yourself in his shoes — so as to see things through his eyes. Avoid self-righteousness like the devil — nothing is so self-blinding. A strategist should think in terms of paralyzing, not of killing. Even on the lower plane of warfare, a man killed is merely one man less, whereas a man unnerved is a highly infectious carrier of fear, capable of spreading an epidemic of panic. … The sword drops from a paralyzed hand. Ensure that both plan and dispositions are flexible — adaptable to circumstances. Your plan should foresee and provide for a next step in case of success or failure. Various fresh ideas gained acceptance … when they could be presented not as something radically new, but as the revival in modern terms of a time-honored principle or practice that had been forgotten. 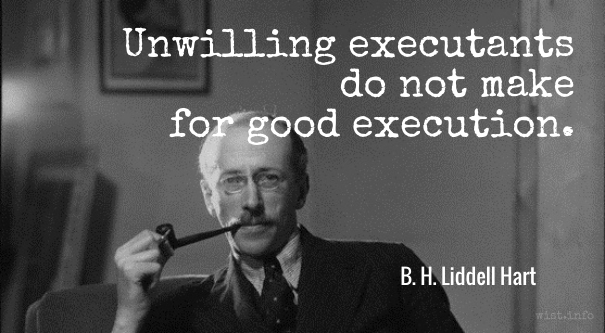 Unwilling executants do not make for good execution. There are over two thousand years of experience to tell us that the only thing harder than getting a new idea into the military mind is to get an old one out. Men are more ready to sacrifice their lives than their livelihood: and to sacrifice their own importance often comes hardest of all. The search for truth for truth’s sake is the mark of the historian. A sound rule of historical evidences is that while assertions should be treated with critical doubt, admissions are likely to be reliable. History marches on the stomachs of statesmen. The vital influences are to be detected, not in the formal documents compiled by rulers, ministers and generals, but in their marginal notes and verbal asides.